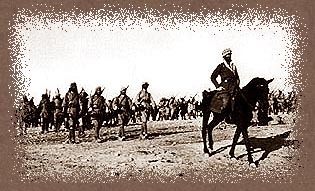 Aqaba, 1917:Troops of the Arab Revolt, "Before Their Diaspora"
Ottoman constitution promulgated. Palestinian deputies from Jerusalem attend the first Ottoman parliament in Istanbul, elected under a new Ottoman constitution. 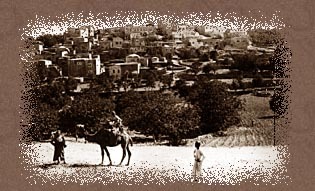 Petah Tikva, the first modern Zionist agricultural settlement, established in Palestine. Ottoman government announces permission for foreign Jews to settle throughout the Ottoman Empire, excluding Palestine. First wave of 25,000 Zionist immigrants enters Palestine, coming mainly from Eastern Europe. Baron Edmond de Rothschild of Paris begins financial backing of Jewish colonization of Palestine. Ottoman government adopts policy allowing Jewish pilgrims and businessmen to visit Palestine but not to settle there. Ottoman government informs Jewish leadership in Constantinople that it views Zionist colonization in Palestine as a political problem. Ottoman government decides to close Palestine to foreign Jewish businessmen but not to Jewish pilgrims. Palestine divided by Ottomans into the districts of Jerusalem, Nablus and Acre - the first was attached directly to Istanbul, the others to the wilayet of Beirut. German Jewish millionaire, Baron Maurice de Hirsh, founds Jewish Colonization Association (JCA). Ottoman government forbids sale of state land to Foreign Jews in Palestine. European powers pressure Ottoman government to permit Jews legally residents in Palestine to buy land provided they establish no colonies on it. Jewish Colonization Association (JCA) begins operations in Palestine. Theodore Herzl, an Austro-Hungarian Jewish journalist and writer, publishes Der Judenstaat, advocating establishment of a Jewish state in Palestine or elsewhere. Ottoman Sultan Abd-al Hamid II rejects Herzl's proposal that Palestine be granted to the Jews. JCA starts assisting Zionist settlement in Palestine. First Zionist Congress in Switzerland issues the Basle Program calling for the establishment of a "home for the Jewish people in Palestine". It also establishes the World Zionist Organization (WZO) to work to that end. In response to First Zionist Congress, Abd-al Hamid II initiates policy of sending members of his own Palace staff to govern province of Jerusalem. Commission headed by Muhammad Tahir al-Husseini, Mufti of Jerusalem, appointed to scrutinize Zionist land acquisition methods. Arabic press reacts to first Zionist Congress: Cairo journal al-Manar warns that Zionism aims to take possession of Palestine. Albert Antebi, JCA representative in Jerusalem, observes that program of First Zionist Congress has adversely affected relations between Palestinians and Jewish immigrants. Herzl sends letter to Palestinian Mayor of Jerusalem hinting that, if Zionists not welcomed in Palestine, they will go elsewhere. Ottoman government sends commission of inquiry to Palestine to study implications of Zionist mass immigration and land acquisition. Pressured by European powers, Ottoman government allows foreign Jews to buy land in Northern Palestine. Jewish National Fund (JNF) set up by Fifth Zionist Congress in Basle to acquire land for WZO; land acquired by JNF to be inalienably Jewish, and exclusively Jewish labor to be employed on it. Ottoman restrictions on Zionist immigration to and land acquisition in Jerusalem district take effect. Administrative Council of Jerusalem strongly objects to JCA 's attempts at acquiring in Jerusalem district. Palestinian farmers in Tiberias region express alarm at extent of Zionist land acquisition. JCA representative Antebi observes that "the ill will of the local population coincides with the creation of Zionism". Second wave of Zionist mass immigration to Palestine begins. Tensions develop between Zionist colonists and Palestinian farmers in Tiberias region. First kibbutz, based on exclusively Jewish labor, established. Report issued by Ottoman governor of Jerusalem on Zionist evasion of Ottoman immigration and land-transfer regulations. Palestinian deputies from Jerusalem, Jaffa, Nablus and Acre elected to Ottoman parliament of 1908 in Constantinople. Beginning of "Young Turks" Revolution in Constantinople. Tel Aviv founded north of Jaffa. Tensions and clashes between Zionist colonists and Palestinian farmers near Nazareth. Zionists issue raised for the first time in Ottoman parliament by Palestinian deputy from Jaffa. Arabic newspapers in Beirut, Damascus and Haifa express opposition to Zionist land acquisition in Palestine. European powers pressure Ottoman government to allow land acquisition in Palestine. Palestinian newspaper Filastine begins to appear; addressing its readers as "Palestinians", it warns about consequences of Zionist colonization. Two Jerusalem deputies open first full-scale debate in Ottoman parliament on Zionism, charging that Zionist aim is to create Jewish state in Palestine. European powers renew pressure on Ottoman government to facilitate Zionist land acquisition in Palestine. Correspondence between Sharif Hussein of Mecca (leader of the Arab Revolt against the Ottomans) and Sir Henry McMahon (British high commissioner of Egypt) begins. Jemal Pasha, Ottoman military governor, hangs 11 Arab nationalists in Beirut. Hussein - McMahon correspondence ends in agreement for postwar independence and unity of Arab provinces of Ottoman Empire. Sykes - Picot Agreement secretly signed, dividing Ottoman Empire between Britain and France. Agreement revealed by Bolsheviks in December 1917. Sharif Hussein proclaims Arab independence from Ottoman on basis of his correspondence with Mc Mahon. Arab Revolt against Constantinople begins. Sharif Hussein proclaimed "King of the Arab countries". Balfour Declaration. British Secretary of State Balfour pledges British support for a "Jewish national home in Palestine". Surrender of Ottoman forces in Jerusalem to Allied forces under General Sir Edmund Allenby. Palestine occupied by Allied forces under British General Allenby. End of World War I.
Abu Ghosh, about fourteen kilometers from Jerusalem, on the road to Jaffa. "Before their Diaspora"
Paris Peace Conference decides conquered Arab provinces will not be restored to Ottoman rule. First Palestinian National Congress in Jerusalem sends two memoranda to Peace Conference rejecting Balfour Declaration and demanding independence. Peace Conference decides to send international commission of inquiry to ascertain aspirations of Near East peoples, led by Americans Henry C. King and Charles R. Crane as England and France decline to participate. Commission recommends that "the project of making Palestine distinctly a Jewish commonwealth should be given up". Disturbances in Palestine: 5 Jews killed and 200 wounded. British appoints Palin Commission of Inquiry; Commission report attributes troubles to non-fulfillment of promises of Arab independence and fear of political and economic consequences of Zionism. General Syrian Congress proclaims independence of Syria, Lebanon, Palestine and Transjordan with Prince Faisal as King. Supreme Council of San Remo Peace Conference assigns Palestine Mandate to Britain without consent of Palestinians. British prevent Second Palestinian National Congress from convening. British civilian administration inaugurated; Sir Herbert Samuel (an Anglo-Jewish politician) appointed first high commissioner. Third Palestinian National Congress elects Executive Committee, which remains in control of Palestinian political movement from 1920 to 1935. Founding of the Haganah, the Zionist's illegal underground military organization. Outbreak of disturbances in Jaffa protesting large-scale Zionist immigration; 46 Jews killed and 146 wounded. British Haycraft Commission of Inquiry attributes disturbances to fears of Zionist mass immigration. Haj Amin al-Husseini appointed Mufti of Jerusalem. Fourth Palestinian National Congress decides to send a Palestinian delegation to London to explain the Palestinian case against the Balfour Declaration. Second Palestinian delegation to London announces rejection of Balfour Declaration to British Colonial Secretary Winston Churchill and demands national independence. Churchill issues White Paper excluding Transjordan from scope of Balfour declaration. Ignoring political criteria, White Paper authorizes Jewish immigration according to "economic absorptive capacity" of the country. League of Nations Council approves Mandate for Palestine. Fifth Palestinian National Congress agrees to economic boycott of Zionists. First British census of Palestine shows population of 757,182, with 78% Muslim, 11% Jewish and 9.6% Christian. Resigning from Zionist Executive, Polish Zionist leader Vladimir Jabotinsky calls for forcible colonization of Palestine and Transjordan. British Mandate for Palestine comes officially into being. Fourth wave of 67,000 Zionist immigrants, over 50% from Poland, increases Jewish population of Palestine to 16% of total. Registered Jewish land ownership (1928) totals 4.2% of area of country. Jabotinsky forms Revisionist Party with aim of "revising" Mandate to include colonization of Transjordan. Palestinian general strike protests private visit by Lord Balfour to Jerusalem. First attempt by some Jewish religious leaders to change "status quo" at Wailing Wall. Islamic Conference, meeting in Jerusalem, demands protection of Muslim property rights at Wailing Wall, itself a Muslim holy site. Palestinians riot in several towns in reaction to militant demonstrations at Wailing Wall. In resulting clashes, 133 Jews killed and 339 wounded; 116 Palestinians killed and 232 wounded, mostly at hands of British military. General conference convenes in Jerusalem to formulate Palestinian position on Wailing Wall controversy. League of Nations Council appoints international commission to investigate legal status of Palestinians and Jews at Wailing Wall. British Shaw Palestinian Commission of Inquiry attributes 1929 disturbances to Palestinian fears of Jewish immigration "not only as a menace to their livelihood but as a possible overlord of the future". Fourth Palestinian Delegation to London. British Hope-Simpson report on land settlement, immigration and development in Palestine concludes that there is not sufficient agricultural land for substantially increased number of Jewish settlers. British Colonial Secretary Lord Passfield issues White Paper of 1930 on Palestine, which takes note of views expressed by Hope-Simpson and Shaw commissions of inquiry. International Wailing Wall Commission recommends restoration of status quo ante and confirms Muslim property rights at Wailing Wall. Irgun Zvai Leumi (National Military Organization), Irgun or IZL for short, founded by Revisionist groups and dissidents from Haganah, advocates a more militant policy against Palestinians. Vladimir Jabotinsky is commander-in-chief. In a letter to Zionist leader Chaim Weizmann, Prime Minister Ramsay MacDonald virtually retracts Lord Passfield's White Paper of 1930. Second British census of Palestine shows total population of 1,035,154 with 73.4% Muslim, 16.9% Jewish and 8.6% Christian. Lewis French, British Director of Development for Palestine, publishes report on "Landless Arabs", caused by Zionist colonization. Formation of Istiqlal (Independence) Party as first regularly constituted Palestinian political party. Arab Executive Committee declares Zionist mass immigration "has terrified the country". British Secretary of State issues statement on resettlement of Palestinian farmers displaced from land acquired by Zionists. Committee calls for general strike to protest British pro-Zionist policies, especially sponsorship of Zionist mass immigration; disturbances break out in main towns. Special commission of inquiry under Sir William Murison reports on causes of 1933 disturbances. Revisionists quit World Zionist Organization (WZO) to form New Zionist Organization with aim of "liberating" Palestine and Transjordan. Large quantity of arms smuggled from Belgium by Zionist groups, discovered at Jaffa port. Sheikh 'Izz al-Din al-Qassam, Muslim cleric from Haifa, leader of first Palestinian guerrilla group fighting British policy in Palestine, killed in action against British security force. High commissioner proposes establishment of 28-member Legislative Council with Palestinians holding only 14 seats; Palestinians accept proposal in principle. Residents of Abu Ghosh, a village west of Jerusalem, taking the oath of allegiance to the Arab higher Comittee, April 1936. "Before Their Diaspora"
Legislative Council proposal defeated by pro-Zionist members in British House of Common. Leaders of Palestinian political parties form Higher Arab Committee under Chairman Haj Amin al-Husseini. Conference of Palestinian National Committees in Jerusalem calls for no taxation without representation. Great rebellion begins. Lebanese guerrilla leader Fawzi al-Qawuqji enters Palestine leading 150 volunteers from Arab countries to help fight British. Royal Commission headed by Lord Peel arrives in Palestine. Irgun/IZL, linked to Revisionist movement under Jabotinsky, reorganizes and advocates armed attacks on Palestinians. Royal Commission report recommends partitioning Palestine into Jewish state comprising 33% of country including Haifa, Galilee and coastal plain north of Isdud; Arab state in rest of country (to be incorporated into Transjordan) and British mandatory enclaves including Jerusalem. Part of Palestinian population to be forcibly transferred, if necessary, from Jewish state. Arab Higher Committee rejects Royal Commission's partition proposal and demands independent unitary Palestinian state "with protection of all legitimate Jewish and other minority rights and the safeguarding of reasonable British interests". Rebellion intensifies. World Zionist Congress in Zurich decides to ascertain "the precise terms … for the proposed establishment of a Jewish state". Arab National Congress at Bludan, Syria, attended by 450 delegates from Arab countries, rejects partition plan, demands end to Mandate, a stop to Zionist immigration and prohibition of transfer of Palestinian lands to Zionist ownership. British dissolve Arab Higher Committee and all Palestinian political organizations. Five Palestinian leaders deported. Haj Amin al-Husseini escapes to Lebanon. British establishes military courts throughout Palestine to counter escalating rebellion. British decides to send technical commission of inquiry, under chairmanship of Sir John Woodhead, to study feasibility of partition as recommended by Royal Commission. Sir Harold MacMichael succeeds General Sir Arthur Wauchope as high commissioner. Irgun/IZL bombings kill 119 Palestinians. Palestinian bombs and mines kill 8 Jews. Technical commission of inquiry arrives in Palestine. British officer Orde Wingate organizes Special Night Squads, composed of British and Haganah personnel, for operations against Palestinian villages. British military commanders take over administrative control from district commissioners to help suppress rebellion, reinforcements brought from England. British troops recapture Old City of Jerusalem from Palestinians. Report of British Woodhead technical commission of inquiry declares impracticality of Royal Commission's partition proposal. British call for general conference on Palestine to be held in London and attended by Arab, Palestinian and Zionist representatives. Palestinian leaders previously deported to Seychelles Island released, but denied return to Palestine. Jerusalem street scene outside Jaffa Gate, early 1940s. "Before Their Diaspora"
London Conference ends with no agreement reached. Malcom MacDonald, Colonial Secretary of State, issues White Paper of 1939 embodying British solution to Palestine problem: conditional independence for unitary Palestinian state after ten years; admission of 15,000 Jewish immigrants annually into Palestine for five years, with immigration after that subject to "Arab acquiescence"; protection of Palestinian land rights against Zionist acquisition. British House of Commons votes 268 to 179 to approve White Paper of 1939. Irgun calls for conquest of Palestine by force. Outbreak of World War II. Stern Gang, formed under Avraham Stern by dissident Irgunists, in protest against 1939 White Paper policy, calls for alliance with Axis powers in war against British. Arrival of over 60,000 Zionist immigrants, including 20 - 25,000 who have entered the country illegally, increases Jewish population in Palestine to 31% of total. Registered Jewish land ownership rises to 6% of area of country. Land Transfers Regulations, suggested by 1939 White Paper to protect Palestinian land rights against Zionist acquisition, enter into force. Death of Vladimir Jabotinsky, right-wing founder of Zionist Revisionist movement. Avraham Stern, founder of Stern Gang, killed by British police. Zionist Biltmore Conference held in New York and attended by leading Zionists from US and Palestine, urges that "Palestine be established as a Jewish commonwealth". Haganah steals arms and explosives from British military installations. David Ben-Gurion states that end of World War II will be beginning of Zionist struggle in Palestine. Five-year limit on Jewish immigration extended so all 75,000 visas permitted in 1939 White Paper can be filled. Stern Gang and Irgun join to conduct terror campaign against British. US Congress introduces joint resolution endorsing Biltmore program. British Labor Party passes resolution recommending that Palestinians be "encouraged" to move out of Palestine to make way for Jewish immigrants. Failure of an attempt by Zionist terrorists to assassinate High Commissioner Sir Harold MacMichael and Lady Mac Michael in Jerusalem. Preparatory Conference on Arab Unity held in Alexandria, Egypt, and attended by Palestinian representatives, proposes formation of Arab state in Palestine in which non-Arab community will have full citizenship rights. Stern Gang murders Lord Moyne, British resident minister of state in Cairo. President Roosevelt meets King ibn-Saud at Suez Canal and assures him US will make no move hostile to Arab peoples. Covenant of League of Arab States, emphasizing Arab character of Palestine, signed in Cairo by representatives of Egypt, Iraq, Lebanon, Saudi Arabia, Syria, Transjordan and Yemen. End of World War II in Europe. On visit to US, Ben-Gurion meets with 19 prominent American Zionists, who pledge to finance purchase in US of military industrial machinery for use of Haganah. President Truman asks British Prime Minister Clement Attlee to grant immigration certificates allowing 100,000 Jews into Palestine. Large-scale illegal Jewish immigration into Palestine resumes under Haganah control. British Foreign Secretary Ernest Bevin issues White Paper announcing continued Jewish immigration into Palestine after exhaustion of 1939 White Paper quota. Arab League secretary general objects to continued Zionist mass immigration and inquires what contribution US and Britain are making to relieve postwar Jewish refugee problem in Europe. King ibn-Saud of Saudi Arabia and King Farouk of Egypt issue joint statement from Cairo expressing support for Palestinians. 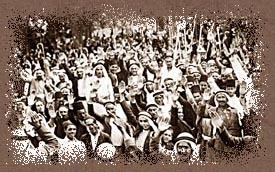 Palestinians strike in protest against British decision to allow Zionist mass immigration to continue at rate of 1939 quota. Anglo-American Committee of Inquiry, proposed in 1945 White Paper, arrives in Palestine. Arab League establishes fund to protect Palestinian farmers from Zionist land acquisition. Anglo-American Committee report estimates size of Jewish armed forces at around 61 - 69,000 people and declares "private armies" illegal. Recommends admission of 100,00 Jews into Palestine and abolition of Land Transfers Regulations. Palestinians strike in protest. Arab League meeting in Syria adopts secret resolutions warning Britain and US that disregard for Palestinian rights will damage their oil and commercial interests in Arab World. Simultaneous attacks by Haganah on eight major railroad and highway bridges. British forces arrest 2,675 Jews, including four members of Jewish Agency, in retaliation for terrorist attacks. British White Paper on terrorism in Palestine accuses Haganah of cooperating with IZL and Stern Gang in acts of sabotage and violence. Anglo-American Conference, meeting in London, produces Morrison-Grady Plan proposing federal scheme to solve Palestine problem; plan rejected by both Arabs and Zionist leaders. Delegates from Arab States to Round Table Conference in London proposes unitary state of Palestine, preserving current Arab majority in which Jews would have full civil rights. British security officer for Tel Aviv killed with his wife when their house blown up by Zionist terrorists. Inner Zionist Council declares that only establishment of Jewish state can solve twin problems of Jewish people and Palestine. Jewish Agency Executive appeals for cessation of acts of terrorism by Jews. Arab League calls on Britain to arm Palestinians against Zionist terrorist attacks. World Zionist Congress, meeting in Basel, decides not to send representatives to London Conference. January: London Round Table Conference reopens. February: British Foreign Secretary Ernest Bevin proposes variant of Morrison-Grady federal plan at London Conference and to Jewish Agency. Arab delegates and Jewish Agency reject proposal. Bevin announces British submission of Palestine problem to United Nations. March: Arab League blames Britain and US for deteriorating situation in Palestine. April: UN General Assembly special session on Palestine problem leads to appointment of eleven-member Special Committee on Palestine (UNSCOP). June: Stern Gang claims responsibility for letter bombs addressed to leading British government officials in London. August: Haganah terrorist attack on Palestinian orange grower's house near Tel Aviv kills twelve occupants including mother and six children. September 8: Publication of UNSCOP report. Majority of members recommend partition and minority recommend federal solution. September 16 - 19: Arab League denounces UNSCOP partition recommendation and appoints Technical Military Committee to supervise Palestinian defense needs. September 26: British Colonial Secretary Arthur Creech Jones announces Britain's decision to end Palestine Mandate. September 29: Arab Higher Committee for Palestine rejects partition. October 2: Jewish Agency announces acceptance of partition. October 29: Britain says it will leave Palestine in six months if no settlement is reached. November 27: Technical Military Committee chairman warns of virtual impossibility of overcoming Zionist forces with irregulars; urges prompt Arab action in organizing military forces; advocates training Palestinians to defend themselves. November 29: UN General Assembly recommends slight variant of UNSCOP partition plan by 33 to 13 votes with 10 abstentions. Arab representatives walk out of assembly. November 30: Haganah calls up all Jews in Palestine aged 17-25 to register for military service. December: Haganah launches Plan Gimmel, designed to destabilize Palestinian population and occupy strategic positions in country. Arab League organizes Arab Liberation Army (ALA), a voluntary force of Arab irregulars under guerrilla leader Fawzi al-Qawuqji to help Palestinians resist partition. December 2: Palestinians start three-day strike protesting UN partition resolution. Intercommunal clashes result in death of eight Jews and six Palestinians. December 5: US State Department announces US embargo on arms shipments to Palestine and Arab states. December 8: Britain recommends to UN that Palestine Mandate be terminated on 15 May 1948 and independent Jewish and Palestinian states be established two weeks later. December 8 - 17: Arab League declares partition of Palestine illegal; it resolves to provide 10,000 rifles, 3,000 volunteers (including 500 Palestinians) and additional 1,000,000 pounds. December 15: British turns policing of Tel Aviv and Petah Tikva over to Jews and that of Jaffa to Palestinians. December 17: Jewish Agency Executive reports that American Jews will be asked for $250 million to help Jewish community in Palestine. December 19: Haganah attacks village of Khisas (Safed district) killing ten Palestinians. December 20: Haganah attacks village of Qazaza (Ramleh district). December 1947 - January 1948: Arab Higher Committee organizes 275 local committees for defense of Palestinian towns and villages. January: British sells 20 Auster planes to Jewish authorities in Palestine. Palestinian guerrilla leader 'Abd al-Qadir al-Husseini secretly returns to Palestine after ten-year exile to organize resistance to partition. January 8: First contingent of 330 ALA volunteers arrives in Palestine. January 14: Haganah concludes $12,280,000 arms deal with Czechoslovakia, including 24,500 rifles, 5,200 machine guns and 54 million rounds of ammunition. January 16: British report to UN estimates 1,974 people killed or injured in Palestine from 30 November 1947 - 10 January 1948. January 20: British administration announces that predominantly Jewish or Palestinian areas will be gradually handed over to local majority group in every area concerned. January 21 & 28: Second and third contingents of 360 and 400 ALA irregulars arrive in Palestine. January - March: JNF leaders encourage eviction from villages of Haifa area. February: Haganah office set up in US under name "Land and Labor" for recruitment of professional military personnel (MAHAL). February 14: Ben-Gurion issues orders to Haganah commander in Jerusalem for conquest of whole city and its suburbs. February 18: Haganah calls up men and women aged 25 - 35 for military service. February 20: Ship Independence arrives at Tel Aviv with 280 volunteers under oath to Haganah on board, implementing policy of illegal immigration of military personnel. February 24: US delegate to UN says role of Security Council regarding Palestine to keep peace, not enforce partition. Syrian delegate proposes appointment of Committee to explore possibility of Jewish Agency - Arab Higher Committee agreement. February 27: Jewish Agency announces it will establish state even without backing of an international force. March: Transjordanian prime minister Tawfiq Abu al-Huda secretly meets British foreign secretary Bevin. They agree that Transjordanian forces will enter Palestine at end of Mandate but will restrict themselves to area of Arab state outlined in Partition Plan. March 2: US delegate tells Security Council US favors implementing partition by "peaceful measures" only. March 5 - 7: Qawuqji enters Palestine and assumes command of ALA units in central Palestine. March 6: Haganah declares general mobilization. March 10: British House of Commons votes to terminate Mandate on May 15th. March 19 - 20: US delegate asks UN Security Council to suspend action on partition plan and to convene General Assembly special session to work on a trusteeship and truce if Jews also accept. Jewish Agency rejects trusteeship. March 19: Ben-Gurion declares Jewish state dependent not on UN partition decision but on Jewish military preponderance. March 25: President Truman secretly receives Chaim Weizmann at White House and pledges support for declaration of Jewish state on May 15th. March 30 - May 15: Second coastal "clearing" operation carried out by Haganah Alexandroni brigade and other units. Attacks and expulsions drive out almost all Palestinian communities from coastal area from Haifa to Jaffa prior to British withdrawal. April 1: Ship Nora delivers first consignment of Czech arms in Haifa. UN Security Council resolutions call for a special session of General Assembly and agree to US proposal for truce to be arranged through Jewish Agency and Arab Higher Committee. April 2: Haganah captures Palestinian village of Castel, west of Jerusalem, expelling its inhabitants. April 5: Palestinian and Zionist leaders object to US proposals presented to Security Council for temporary trusteeship agreement. Haganah launches Operation Nachshon (first phase of Plan Dalet); Haganah Giv'ati Brigade and other units capture villages along Tel-Aviv - Jerusalem road from local Palestinian militia. April 8: Haganah starts offensive against Palestinian town of Tiberias. April 9: 'Abd al-Qadir al-Husseini, charismatic Palestinian militia commander in Jerusalem district, is killed leading counterattack to recover Castel village. Irgun and Stern Gang massacre some 120 inhabitants in village of Deir Yassin, western suburb of Jerusalem and three miles from Castel. April 12: General Zionist Council decides to establish independent Jewish state in Palestine on May 16th. April 13 - 20: Operation Har'el under Plan Dalet launched at conclusion of Operation Nachshon. Villages along Jerusalem road attacked and demolished. All subsequent Haganah operations until May 15th undertaken within framework of Plan Dalet. April 16: British evacuate town of Safed. April 17: Security Council resolution calls for military and political truce. Haganah starts offensive against town of Safed. April 20: US submits Palestine trusteeship plan to UN. 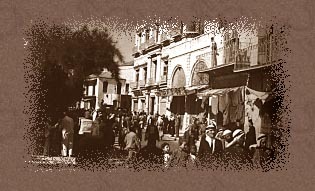 April 21: British suddenly evacuate residential quarters of Haifa. April 22: Haganah launches Operation Misparayim to attack and occupy Haifa. Resistance of local Palestinian militia in Haifa collapses. Haifa's Palestinian population flees under combined shelling and ground offensives. April 25 - 31: Launching of Operation Chametz to conquer Jaffa, Haganah attacks suburban villages of Tell Rish, Yazur and Salameh. April 26: Lauching Operation Yevussi for conquest of whole of Jerusalem; Haganah attacks Palestinian residential quarter of Sheikh Jarrah in East Jerusalem, cutting off the city from north, but are forced to hand it over to the British. Haganah's attempt at cutting off Jerusalem from Jericho fails. April 27: Haganah announces coordination of plans with Irgun. April 28 - 30: Palestinian ALA unit under Michel Issa succeeds in fighting its way into Jaffa in order to break Haganah siege. April 30: All Palestinian quarters in West Jerusalem occupied by Haganah and residents driven out. May 1: Lebanon and Syria decide to send troops to Palestine at end of Mandate on May 15th. May 2: Iraq dispatches troops to town of Mafraq, in Transjordan, en route to Palestine after May 15th. Three planeloads of arms for Haganah arrive from France. May 3: Between 175,000 and 200,000 Palestinian refugees are reported to have fled from areas taken by Zionists. Jewish colonists from Gush Etzion, south of Jerusalem, ambush traffic on road to city. May 4: Unit of Transjordan Arab Legion, operating in Palestine under British command, shells Gush Etzion in retaliation for ambush. British announces it is studying transitional trusteeship regime for Palestine to take effect at end of Mandate. May 5: ALA unit under Michel Issa withdraws from Jaffa, ending city's resistance. May 10: Haganah enters Jaffa. May 11 - 12: Haganah captures Safed and surrounding villages. May 12: State of emergency declared in all Arab countries and able-bodied Palestinian men barred entry to them. Egyptian parliament decides to send troops to Palestine at end of Mandate. May 12 - 14: Arrival of second and third Czech arms consignments for Haganah. May 13: Arab Legion, ALA and local militia attack and capture Jewish settlements of Etzion bloc, retaliating for attacks on Hebron road. Jaffa formally surrenders to Haganah. May 14: State of Israel proclaimed in Tel Aviv at 4pm. Haganah launches Operation Schfifon for capture of Old City of Jerusalem. May 15: British Mandate ends. Declaration of State of Israel comes into effect. President Truman recognizes State of Israel. First Egyptian troops cross border into Palestine and attack colonies of Kfar Darom and Nirim in Negev. Three Transjordanian Arab Legion brigades cross Jordan River into Palestine. Lebanese troops retake Lebanese villages of Malkiya and Qadas (on Lebanese border), attacked and captured earlier by Haganah. May 17: Haganah captures Acre. May 18: Syrian troops retake Palestinian town of Samakh, south of Lake Tiberias, and capture Zionist colonies of Shaar Hagolan and Masada. Arab Legion units reach Latrun and consolidate blockade of coastal road to Jewish quarters in Jerusalem. May 19: Haganah breaks into Old City of Jerusalem. Arab Legion comes to the rescue of Old City. May 20: UN Security Council appoints Count Folke Bernadotte as its mediator in Palestine. May 22: Security Council resolution calls for cease-fire. June 11 - July 8: First truce. June 28 - 29: Count Bernadotte suggests economic, military and political union of Transjordan and Palestine containing Arab and Jewish states: Negev and central Palestine to go to Arabs, Western Galilee to Jews, Jerusalem to be part of Arab state with administrative autonomy to Jews, Haifa and Jaffa to be free ports and Lydda free airport. Rejected by both sides. July 7: Security Council calls for prolongation of truce. July 15: Security Council resolution calls on governments and authorities concerned to issue indefinite cease-fire orders to their forces in Palestine to take effect within three weeks. July 18 - October 15: Second truce. September 16: Report by UN mediator Count Bernadotte proposed new partition of Palestine: Arab state to be annexed to Transjordan and to include Negev, al-Ramla and Lydda; Jewish state in all of Galilee; internationalization of Jerusalem; return or compensation of refugees. Rejected by Arab League and Israel. September 17: Count Bernadotte murdered in Jerusalem by Stern Gang. Replaced by his American deputy Ralph Bunche. November 4: UN Security Council resolution calls for withdrawal of forces to positions occupied prior to October 14 and establishment of permanent truce lines. November 1948 - mid 1949: IDF expels inhabitants from villages 5-15 km inside Lebanese border, followed by expulsions from other Galilee villages. December 22 - January 6, 1949: Operation Horev launched to drive Egyptians out of southern coastal strip and Negev. Israeli troops move into Sinai until British pressure forces withdrawal. December 27: IDF Alexandroni brigade's attack on isolated Egyptian forces in Faluja pocket is repulsed . February 24: Israeli-Egyptian armistice: Egypt keeps coastal strip Gaza-Rafah and evacuates Faluja pocket. End of February: IDF units intimidate 2-3,000 villagers into leaving Faluja pocket in violation of Israeli-Egyptian Armistice Agreement. March 23: Israeli-Lebanese Armistice: Frontier of Mandate Palestine accepted; Israel withdraws from most of Lebanese territory. April 3: Israeli-Jordanian Armistice: Jordan takes over Iraqi-held Nablus-Jenin-Tulkarem triangle but is forced to cede area around Wadi 'Ara; Israel controls Chadera-Afula road; existing status quo in Jerusalem accepted by IDF and Arab Legion.